Clock Tower is a royal monument in the Church road of Alwar city. The clock tower has a large four-sided clock on the top of it which had been very helpful for locals in doing their day to day work on time.There is also attractive architecture structure present in the lower part of the tower. The middle part of the tower has written patriotic slogans. Located in the fifth street from the church road, Clock tower shows the progressive rule of the illustrious Rajputs. 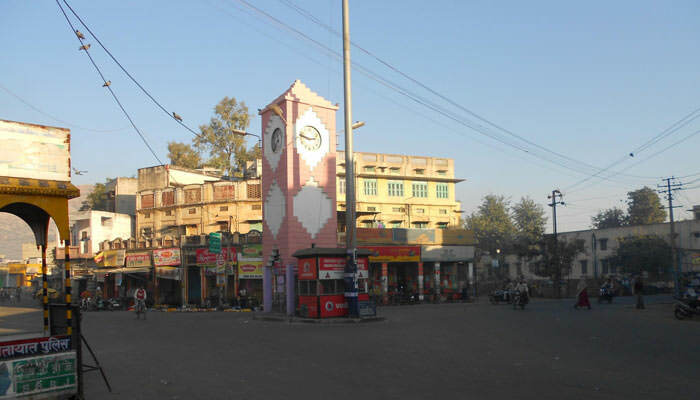 By Road: Clock Tower is located in the centre of Alwar city at Church Rd. One can easily reach here by local bus or taxi or by walk. By Rail: Clock Tower is well connected through nearest Alwar Railway station (2 km) to major cities railway stations like Delhi, Agra, Mumbai, Chennai, Bikaner, Pali, Jaipur, Ahmedabad. By Air: Clock Tower can be reach through nearest Delhi IGI airport (163 km) and Jaipur Airport (155 km) which is well connected with regular domestic flights to Delhi, Mumbai.